A series of blueprints for Warner Bros. Movie World's forthcoming hyper coaster don't give away anything in terms of the roller coaster's track layout or theme, but they do answer a few minor questions about the the ride experience. This indicates that – like Superman Escape or Arkham Asylum - Shock Therapy – it'll be capable of operating with two trains during peak periods but use only single train operation for much of the year to allow for maintenance work on the non-active train. Does AA operate with a second train during peak periods? I've never seen a second train, let alone two operating at once...... but not that I'm there all the time (I also thought there had been theoretical discussions on this site about MW getting a second train to increase capacity). Yeah that wasn't worded too clearly; removed the reference to Arkham Asylum because it just made the example confusing. 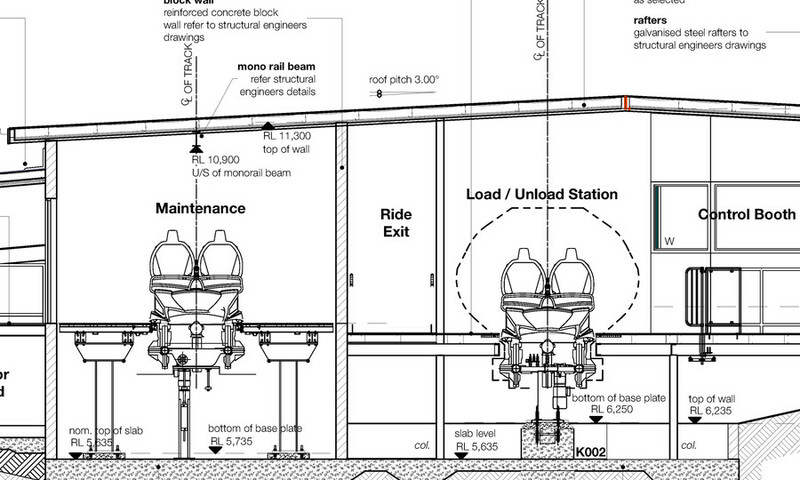 Of course the ride is designed to operate with two trains but they don't currently have a second train. The current Kumbak-built train uses the original Vekoma chassis and of course prior to that the two trains effectively became one as one was cannibalised for spare parts for the other.